Bill de Blasio Is New York’s Most Progressive Mayor in Decades—Is That Enough? As opposition mounts, the solution to de Blasio’s problems might lie in even bigger, bolder interventions. When Bill de Blasio emerged from the City Hall subway station a few minutes before his inauguration two Januarys ago, he wore a smile and a crisp suit. On his right were his wife, son, and daughter. On his back were two narratives destined to define his first 24 months in office. One was “A Tale of Two Cities,” de Blasio’s campaign critique of an increasingly unequal New York, characterized by rising rents, swelling homeless shelters, and racially skewed policing. The other was the notion that as a liberal mayor with little executive experience, de Blasio was doomed to mismanage the city into a return of “the bad old days.” He’d won the 2013 race because of the former and despite the latter; the two narratives represented the lenses through which his performance as mayor would be viewed by friends and foes—and not just in the five boroughs. With anxiety over income inequality coloring the political mood well beyond the city’s borders, de Blasio was anointed by The Nation and others as the standard-bearer for a new progressive movement. The hype meant high stakes. 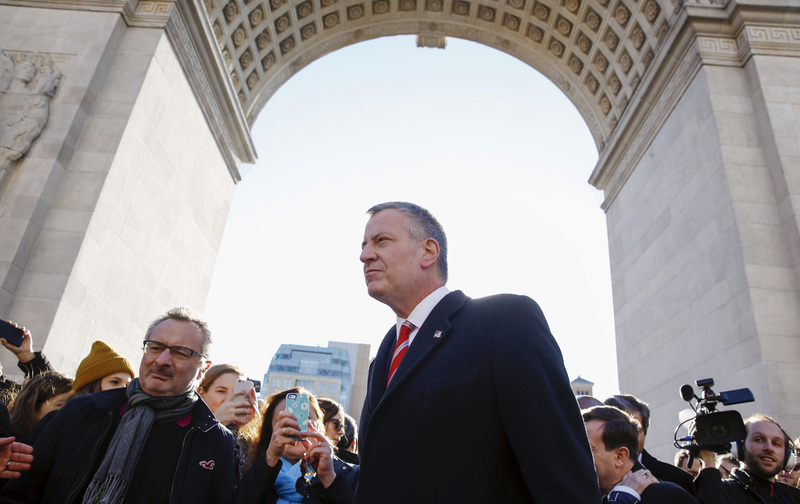 If de Blasio succeeded, he could help create a new national consensus around leftist policies. If he failed, John Lindsay would no longer be the person to whom hapless mayors were compared. Midway through his first term, de Blasio has alternately fulfilled and frustrated his friends’ hopes and his enemies’ scorn. He has racked up substantive policy victories, like universal pre-kindergarten, Vision Zero traffic-safety improvements, a hugely popular municipal-ID program, and a rent freeze for many rent-regulated apartments, and he has taken aggressive stands on the minimum wage, climate change, and mental-health services. But few of his allies seem satisfied with the pace of reform or his ability to articulate a progressive vision, and the mayor has alienated some with his plan to rezone low-income neighborhoods. As a manager, de Blasio has often defied the predictions of ineptitude: His budgets continue to run surpluses, Pre-K for All’s rollout was remarkably smooth, and he has steadily and responsibly worked through a massive set of overdue labor negotiations left by his predecessor, Michael Bloomberg. But these feats have been overshadowed by missteps: egregious lateness during his first year, pettiness with the press, unseemly ties to lobbyists, and premature efforts to take on a national role. These foibles delight his critics and terrify his allies, who see not just his reelection prospects, but the broader opportunities for progressive change, suffering with each snafu. In many ways, the de Blasio team has tried to rejigger well-known policy options rather than imagine new ones. Given de Blasio’s background as a campaign operative, the biggest surprise of his mayoralty so far has been the strategic blundering. The local backlash to his housing proposals suggests a political radar that needs recalibration—fast. And de Blasio has consistently been outmaneuvered by Governor Andrew Cuomo. It’s not the mayor’s fault that Cuomo—a political warrior of uncommon ruthlessness—seeks to belittle him at every turn, but de Blasio seems incapable of ducking any of Cuomo’s jabs. The biggest surprise of the past two years might be that Bill de Blasio has proven to be a better mayor than a politician. That’s not necessarily good news, since de Blasio is in a predicament that only a skillful pol can escape. He bears massive expectations, faces strong enemies, wields only limited powers, and is supported by often-hesitant allies. Through more than a dozen interviews with social-justice advocates, The Nation has found that there’s a lot for the mayor to be proud of—and much for him to figure out if he wants to transform the city from a symbol of extreme stratification into a model of equity. Highlight: During his first full fiscal year in office, the city created more affordable apartments than in any prior year: 20,325 of them, enough for 50,000 people. Lowlight: As of December, there were almost 58,000 people in the city’s homeless shelters. Faced with one of the most extreme affordable-housing crises in the country, the de Blasio administration has rightly treated the issue as its biggest policy test. In May 2014, it announced a $41 billion plan, hailed by the mayor as the “most ambitious” in the country, to build or preserve 200,000 units of affordable housing over the next 10 years. The plan far outstrips Bloomberg’s efforts and is certainly “ambitious.” The problem is that earlier, smaller, but similar plans failed to stave off a huge loss of affordable units in the city. In many ways, the de Blasio team has tried to rejigger well-known policy tools rather than imagine new ones. City Hall’s prescription for the housing crunch is, for the most part, “more”: more market-rate housing and more affordable housing, with the former sometimes subsidizing the latter, all toward the goal of a denser, more equal city. Through tax breaks and so-called inclusionary zoning, this approach can produce affordable housing. The question is whether it can generate enough to offset the impact of the market-rate development on which it depends. Past experience makes many communities wary of this approach. Because of federal-subsidy rules, “affordable housing” rents tend to be set for households more affluent than those that actually exist in the targeted neighborhoods—a problem that the administration has tried to mitigate but can’t altogether solve. And the mayor’s plan—which would offer particular incentives to developers of affordable units in places like East Harlem and Flushing—strikes some as a dangerous trade-off, inviting in the very type of real-estate investment that has already made other neighborhoods unaffordable. De Blasio’s efforts to respond to the homeless crisis he inherited have been similarly stymied. An uptick in the number of homeless people living in the streets sparked a political uproar last summer (and led to troubling police crackdowns), spurring a shake-up at the city’s homeless-services agency in December. But the administration has also launched eight rental-subsidy programs to move people out of shelters and into their own apartments. Jeff Foreman, policy director at Care for the Homeless, notes that the de Blasio administration has spent millions more on prevention and also agreed to create 15,000 supportive-housing units. But the funds necessary to bring these programs to the needed scale have not been forthcoming from Cuomo. Meanwhile, thanks to the federal government’s long-standing disinvestment policy, the city’s public-housing developments remain mired in a fiscal crisis, leading the mayor’s team to propose controversial steps—such as allowing the private development of mixed-income housing on land owned by the New York City Housing Authority. Still, Vic Bach, a public-housing expert at the Community Service Society of New York, or CSS, credits de Blasio with ending the practice of charging the housing authority for police services, and for committing $300 million in capital funding to fix roofs. “Compared to the previous mayor or mayors, he’s paid a lot of attention to NYCHA’s financial needs and concerns,” Bach says. Can the mayor trust enough in his vision to be truly bold? Can his allies trust him enough to give him the room he needs to be reelected? Highlight: Within months of taking office, de Blasio signed a law mandating sick leave for up to 500,000 workers. Lowlight: The rate of people living in poverty hasn’t budged, remaining at 20.9 percent. De Blasio chose a formidable enemy when he railed against economic polarization on the campaign trail. Not only is inequality partly the result of global changes in trade, the use of technology, and the value of education—forces difficult for any city government to resist—but the de Blasio administration faces strict limits on how much redistribution it can affect, giving the mayor little power to reset relations between the 1 percent and the rest of us. Yet de Blasio has used what power he has to significant effect. He signed a sick-leave bill into law and used executive action to expand living-wage provisions. “I would give him good grades on certain things,” says CSS policy expert Nancy Rankin. “On the paid-sick-days expansion, he did a robust outreach effort on enforcement,” while universal pre-K is “not only important for early-childhood education but immediately provides quality childcare for people trying to work, and it creates a lot of good public-sector jobs.” In mid-December, de Blasio announced that he was granting six weeks of paid parental leave for nonunion city workers—a bold step toward a more humane workplace. The bad news for de Blasio has come from the governor’s mansion. The mayor’s pre-K program was supposed to be funded by a dedicated tax on the rich, but Cuomo blocked it. When de Blasio advocated allowing the city to set its own minimum wage, Cuomo shot that down, too. But after a scare from the left in the 2014 gubernatorial primary—a threat that de Blasio helped neutralize—Cuomo began pushing for economic policies very similar to the ones he’d mocked the mayor for, like a higher minimum wage. Although the governor will never give de Blasio credit for the shift, he likely deserves some. Highlight: Police encounters under the NYPD’s stop-and-frisk program have fallen from 21,187 in the third quarter of 2013 to 4,747 in the third quarter of 2015. Lowlight: Of the roughly 148,000 misdemeanor arrests in the city during the first nine months of 2015, 87 percent involved people of color. De Blasio’s come-from-behind victory wouldn’t have happened without the commercial featuring his teenage son Dante talking about the New York Police Department’s stop-and-frisk program, a policing strategy that enabled cops in the Bloomberg years to stop astronomical numbers of people—mostly black or Latino—who were rarely found to be doing anything wrong. Police reform was always risky territory for de Blasio. Right-wing critics wagered that crime would explode under his watch; if it did, he would certainly fail to be reelected. The left, angry about NYPD policy since the Giuliani administration, had steep expectations for what a progressive mayor ought to deliver. In the end, de Blasio tried to please both: While vowing to end stop-and-frisk abuses, he chose to shore up City Hall’s law-and-order credibility by bringing back Bill Bratton, a champion of “broken windows” policing, to run the NYPD. Two tempestuous years later, neither side is satisfied. Seizing on a small increase in violence, the right is threatening to support former police commissioner Ray Kelly as a mayoral candidate, while some on the left are unimpressed by the huge drop in stop-and-frisk numbers amid continued high levels of misdemeanor arrests, which disproportionately affect people of color. “The problem is that there’s been no significant change,” says Robert Gangi, executive director of the Police Reform Accountability Project. Highlight: In its second year, Pre-K for All registered 65,504 children. Lowlight: The racial gap in math proficiency remains wide. On the 2015 state tests for grades 3 to 8, 56.7 percent of white students performed at grade level, compared with 23.7 percent of Latinos and 19.1 percent of blacks. De Blasio’s universal pre-K success and his appointment of a seasoned educator as schools chancellor—unlike Bloomberg, who twice picked education novices—have earned praise from veteran education-policy expert Diane Ravitch. “He actually is trying to improve the public schools, not demolish them,” she says. Among the better programs de Blasio has created are Renewal Schools, targeting low-performing schools for interventions, and Community Schools, which use school buildings to deliver a range of services to low-income neighborhoods. Not everyone is content with the mayor’s performance. Education advocate Leonie Haimson says that de Blasio “made very specific promises around issues like reducing class sizes, expanding the school capital plan, more transparency in terms of the budget, more input for parents”—promises that, she argues, have yet to be fulfilled. Other allies contend that his response to criticism over racial disparities and extreme segregation has been flat-footed. Some of the mayor’s loudest critics can be found in the charter-school industry. With Cuomo on their side, supporters not only beat back the de Blasio team’s early decision to reject a handful of charter applications for space in public schools; they also won a new state law essentially forcing the city to give them as much space as they want. De Blasio was further humbled in 2015 when his control of the school system was renewed for just one year— unlike the multiyear deal twice given to Bloomberg. Highlight: The administration has committed to reducing New York City’s carbon footprint by 80 percent of 2005 levels by 2050. Lowlight: Despite setting a “zero waste to landfills” goal, the city recently inked a 20-year, $3.3 billion deal to haul trash to landfills. The night de Blasio was elected, I spoke with an environmental activist who confessed to anxiety. Compared with Bloomberg, the mayor-elect had said almost nothing about environmental policy during the campaign. Since then, however, de Blasio has been extremely vocal on such issues, adopting a far more aggressive greenhouse-gas reduction target and wedding his push for social equality to the goal of a greener city in a vision document called OneNYC, released last Earth Day. Mark Dunlea, an activist on the 350 NYC steering committee, says the mayor “does deserve some credit on climate change, though Hurricane Sandy…the People’s Climate March, and the pope’s visit created pressure for action.” However, Dunlea sees him stopping short of bold action—for example, by avoiding specific commitments to wind power in renewable-energy plans, or by calling for a study before divesting the city of all fossil-fuel stocks. But Dunlea adds that de Blasio “does deserve credit for… addressing environmental justice,” and proposes some overall letter grades: A-minus for vision, B-minus for execution. Those are more generous marks than others would give, but the consensus seems to be that Bill de Blasio still believes in the right things. The doubt is over his delivery. New York City has more than 4 million registered voters, but fewer than 800,000 cast their ballots for de Blasio. The low turnout indirectly validated his rationale for running, suggesting that vast numbers feel shut out not just from the economy but from politics—a different take on “A Tale of Two Cities.” New York City’s democracy is faltering, partly because trust in government has evaporated. This lack of trust touches us all and is de Blasio’s most dangerous enemy. Can the mayor trust enough in his vision to be truly bold? Can his allies trust him enough to give him the room he needs to be reelected and buy time to make real change?